Salisbury’s Old Manor Hospital was a mental hospital, which grew out of a private asylum started in the early C19th, and closed in 2000. Since then the small part of it to the north of the Wilton Road has been successfully tidied up, and the buildings re-used, but the major part to the south of the road still has a long way to go. This is typified by the very visibly propped facades of the listed Finch House, formerly the main mental hospital building, and by the building site west of it. This whole part of the site was bought in 2014, for £4.1 million, by The Quantum Group, Bournemouth-based developers who run care homes, and build properties for the retired. Previously Wiltshire Council had offered the NHS £1 for the site, no doubt not a realistic bid but probably more expressive of its true value, given the state of the two listed buildings on it and the cost of putting them back into use. Finch House has permission for conversion to flats, with an acceptance that the original interior was compromised and difficult to convert, and that a completely new interior was needed. However preliminary work showed that the outer walls were in a poor way, and it is now unclear how much of them will survive, and to what extent the outcome will just be a replica building. To the west of Finch House, and set further back from the Wilton Road, is the other listed building, Avon House, on which work has yet to start. It also has permission for conversion to flats, but even from the limited public viewpoints, its poor condition is obvious. The developers originally sought to demolish Finch House, and it is by no means impossible that when work does start on it, they will claim that it is beyond saving. All the non-listed buildings on this part of the site have been demolished, with the exception of a terrace of cottages south of Avon House. Old photos of the hospital show this to have been a prominent feature, along with several lawns to wards and other facilities, now all disappeared. The Civic Society, and others, argued strongly for the retention of the terrace, against the developers’ wish to see it go, and the Society was very happy to see an eventual plan which saw it retained. However the retention of this feature, and the need to spend a lot of money on the other old buildings, has meant that a large number of retirement flats need to be fitted on to the site, with results which are now apparent. 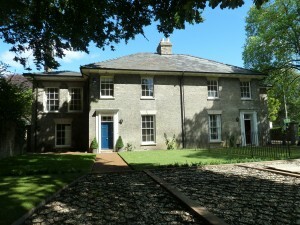 Two large pedimented ‘mansion blocks’ have risen, using an unattractive brick, and owing nothing to the history of the site. Another large block, of a slightly different style, is due to go up in the south-eastern corner of the site. Smaller buildings, of no distinction, will crowd round Avon House, assuming it is indeed saved. A large new splayed entrance to the site has been created west of Finch House, leaving only a small section of the boundary wall which once characterised the whole hospital complex. A building being constructed immediately east of the entrance was originally supposed to house a large convenience store, but the developers were unable to find a user, and have applied for much less retail space there – and more flats. An original aspiration for a ‘market street’ running through this part of the site, to be used by Salisbury residents around the site as well as those living there, seems unlikely to get anywhere much. Overall, eventual completion of the Quantum scheme for the southern part of the site is still some way off, but it should be the final stage of a return to tidiness and sensible use on a part of the city which has been shabby and neglected for far too long. What this whole process will not achieve is either any retention or recreation of the particular character which the Old Manor Hospital certainly had, or the achievement of good contemporary design which creates a quarter of the city with an equally strong, if rather different, character. Some concerted and committed planning once the hospital closed could certainly have created more of a connection to a remarkable past than will now be visible. The Old Manor Hospital site comprises two areas of land, separated by the Wilton Road. By far the largest is that on the south side of the road, which contains three listed buildings and a listed fountain. The part on the north side contains a further two listed buildings, and all the site is within the Old Manor Hospital conservation area, one of three which cover Salisbury. In the 1920s and 30s the hospital was, according to one account, the largest private mental hospital in Europe. Since it was taken over by the state in 1954, approaches to mental health care have of course radically altered, and the current facilities are very different, and occupy much less of the site. On the south side of the road are the main former hospital building, the Grade II listed Finch House, and other buildings which deserve to be retained, all now unused, together with a large area of land which is open to redevelopment. A design brief was produced in 2000 to direct the future of the whole site, driven by the expectation that the primary use of any surplus land or buildings would be residential, and the Civic Society made the point, then and subsequently, that any such development needed to be of the highest possible design standards. The conservation area designation for the site theoretically gives the Council the power to require this, though of course views may differ as to what constitutes good design, and the planning system is in any case not an ideal tool for achieving it, particularly given the key role almost invariably given to the profit motive. 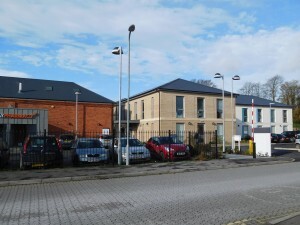 In the early 2000s, three new buildings for mental health care were constructed, two of them on the southern border of the site, and one at its eastern end, on the Wilton Road. The single storey form of the latter one in particular, while aimed at meeting the specific needs of its function, did not put back anything of great distinction onto the site, and was a complete contrast with the mental hospital buildings previously there. After that, an interminable process saw the rest of the southern side of the site, which was in the ownership of the Wiltshire Primary Care Trust until it and similar bodies were wound up in March 2013, subjected to various changes of mind as to what its future should be, and what mechanisms should be in place to create that future. 2012 finally saw some movement, on one part of the site at least. In May of that year permission was granted for a scheme to create new premises for two Salisbury GP practices, plus additional facilities, making use of the former hospital ballroom, south-east of Finch House, and land between it and the Wilton Road. The ballroom is a structure of some interest, which the Society sought unsuccessfully to have listed in 2006. Its exterior has been retained, but much of the interior has been subdivided, and the lawn to the west of it has become a car park. Old photos of the Old Manor Hospital show lawns next to the wards and other buildings to have been a major part of its character, and the disappearance of what was the last one to survive is another sad chapter in a fairly depressing tale. The new GP premises opened in January 2014. Between the ballroom and the Wilton Road are new buildings, unshowy but of significant design merit. Unfortunately the scheme is somewhat let down by its landscape elements, and especially the treatment of the Wilton Road boundary, which falls well short of what might have been achieved, no doubt as much as anything because it was not seen as a high priority when funds were allocated at the outset of the project. After the land for the GP surgery had been hived off, the Primary Care Trust put the rest of the part of the whole site within its ownership, a very substantial area, on the market. This marked the end of a proposal by Wiltshire Council to take on some at least of the land for elderly and dementia care, an idea which seems to have foundered when the Primary Care Trust declined to take up the Council’s suggestion that the former should in effect give them the land they required, free of charge. During 2014 discussions about use of the land for sale by a major national supermarket group foundered, and by the end of the year it had been purchased by The Quantum Group, Bournemouth-based developers who own the Cross Keys shopping centre in Salisbury. Among other things the company runs care homes, and builds properties for the retired. The purchase price was apparently £4.1 million. During 2015 the company presented its ideas for the Old Manor site to the Civic Society, revealing an approach that divided the site into five distinct areas, to be the subject of a phased approach. 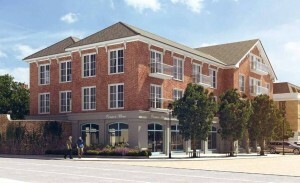 The ultimate aim is 186 retirement apartments, plus communal facilities and a convenience store type shop by the main entrance from the Wilton Road. Care will be available to residents, but with no specific dementia care provision. The first phase, west of Finch House, was the subject of a planning application in October 2015, with the other four phases apparently due to follow at intervals of very roughly a year. Finch House, together with the other listed building on the site, Avon House, will be retained, but a terrace south of the latter, which has been identified as important to the history and character of the site but is not listed, is shown in the indications of future phases as being demolished. Following two visits by the Quantum Group’s architect to committee meetings, and the Society sending comments to Quantum based on what it had been shown, the submission of what is a major application for the city ended with two representations going to the council planners. The first dealt with landscape matters, and expressed considerable concern that most existing trees on the site, some of them quite prominent, were due to go, and that the replacement planting was not shown as using species which would end up with equal prominence. The character of the site was likely to be permanently downgraded as a result. The second representation dealt with the design of buildings. With a fairly intensive use of the site dictated by the price paid for it, and the major costs entailed in rescuing its listed buildings from years of neglect, the Society saw little point in arguing for a radically different approach which might have corresponded more with the mostly low-level, spread out character of the former hospital (as shown in the aerial view from the 1920s or 30s). It accepted that the phase 1 layout had already been the subject of discussions with the planners, and concentrated on the detailed design within that layout. An out and out neo-Georgian approach seen on the first visit from the Quantum architect, and not much liked, had been changed, but still with elements left behind which seemed to add nothing to the design. The Society’s comments are set out in full below. Surplus land and buildings to the north of the Wilton Road were in different ownership, that of the Salisbury Foundation NHS Trust, who subsequently sold them on. The two listed Paragon buildings, fronting the Wilton Road, have now been repaired and returned to their original residential use, though permission for flats immediately to their west was refused. These would have replaced a small lodge, next to the new and quite bulky courts building. The future of the lodge, which helps to identify some of the history of this part of the site but is unlisted, is uncertain. To the north was the house known as Llangarren, with a similar date of 1840-50 to that of the Paragon pair, and clearly built as part of a group with them. In 2006 the Civic Society proposed to English Heritage that Llangarren also deserved listed status, but as with the ballroom the request was denied, on the grounds that the house had been too greatly changed, and that its relationship to the Paragon buildings had been too compromised to make listing justified. It was sent further downhill by a fire in 2009 which gutted the building, and its surviving walls have now been incorporated as the central part of a new care home, which has completely changed the whole character of this part of the site and removed much of its historic significance. The rescue of the Paragon buildings has been carried out to exceptionally high standards, leading to its receiving the Society’s Lady Radnor Award, for the most outstanding project seen by the judging panel for the 2014 buildings awards scheme. In September 2015 a chance to visit No 4 The Paragon, and see the transformation achieved from its previous state of wretched neglect, was one of the highlights of the Civic Society’s Historic Open Days weekend, which focused on this part of the city. Those participating also commented very favourably on the new medical practice buildings to the south, and the new care home next door to the Paragon. Overall, eventual completion of the Quantum scheme for the southern part of the site will be several years away, but it should be the final stage of a return to tidiness and sensible use on a part of the city which has been shabby and neglected for far too long. What this whole process will not achieve, regardless of the design qualities of individual components within it, is any real retention or recreation of the particular character which the Old Manor Hospital certainly had. Given that the institution had developed on a rather ad hoc basis, rather than through the creation of new purpose-designed mental hospital buildings which lent themselves to conversion, it was probably always likely to be the case that the final outcome would be something that retained only a modest amount of the original character. However some concerted and committed planning once the hospital closed could certainly have created more of a connection to a remarkable past than now seems likely to be visible. Blocks A & B (matching pair on S side of phase 1 site) This works well at first and second floor level, with large and well-proportioned windows set within simple brickwork. The ground floor, however, moves away from this subtle hinting at the classical tradition into a more heavy-handed adoption of classical precedents, through the use of rusticated render, something accentuated by the pediments on the outward facing elevations, and the entrance porches on the inner ones. Above the second floor, the bulky eaves course and the mansard roof above it have a similarly detracting effect on the simplicity of the middle zone. Furthermore, question marks have to be raised as the final visual effect of the upper storey, given that it is shown with solar panels which will require access, and therefore a possible need for guard rails and perhaps other clutter. A fourth floor is no doubt needed to obtain the number of units required to make the scheme commercially viable, but could be achieved more subtly by a lighter-coloured and flat-roofed story set back behind the facade line. This could then be given a parapet, and the solar panels and any other rooftop additions could thereby be hidden. The overall effect of these blocks is one of heavy-handedness and a lack of elegance, achieving neither the classical distinction which the neo-Georgian approach is capable of when done well, nor the simpler distinction of a well-conceived out and out contemporary approach. Block D (convenience store on corner with Wilton Road) The Society finds this very disappointing. Like blocks A and B, it owes nothing to any historical style discernible within the site, nothing to the wider traditions of Salisbury buildings, and fails to compensate for these failings by achieving any independent design distinctiveness. Its red brickwork is likely, based on modern brickwork elsewhere in the city, to be banal at best. The Society maintains that a much more contemporary approach, looking for instance to the outstandingly successful Bourne Hill extension, could work far better in this location, adding real design distinction to the site without in any way detracting from the listed Finch House next door. Block C (to the W of the older, retained part of Finch House) This is the one part of the scheme which works well, achieving a simplified, stripped-down classical effect without any extraneous details or add-ons. While its white render will obviously need careful detailing, and maintenance, to keep its freshness, it is likely to be more successful than large areas of brickwork, particularly where the latter is seeking to fulfil the historically thankless task of in some way matching the Fisherton Grey brick which is a prime component of the character of this part of Salisbury, but has long been unobtainable. Applying the Block C approach to a much higher proportion of the scheme would be of great benefit to it. Overall, the Society accepts that the price paid for the site, coupled with the considerable expense of rescuing its long-neglected listed buildings, dictates a high density development a long way removed from the former mental hospital character. Nevertheless, within these constraints there is scope for a less heavy-handed approach, as demonstrated by one relatively small part of the scheme itself. A further demonstration comes with the indication in the application documentation of the likely design of the final phase of the Quantum scheme, the Station Courtyard in the SE corner of the whole Old Manor site, which again uses a refreshingly simple approach.